NEW PRODUCT – PN532 NFC/RFID controller breakout board – v1.0 « Adafruit Industries – Makers, hackers, artists, designers and engineers! 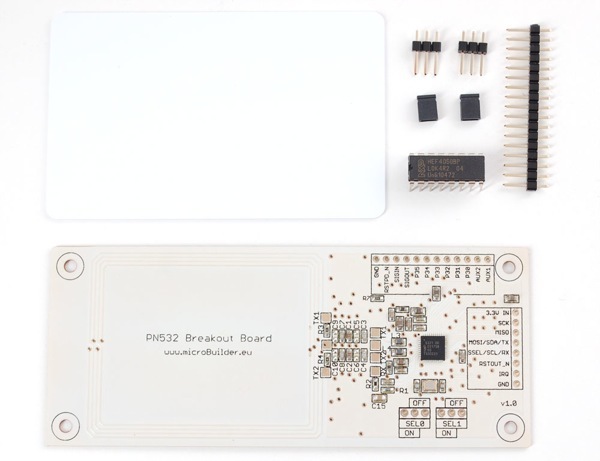 NEW PRODUCT – PN532 NFC/RFID controller breakout board – v1.0. The PN532 is the most popular NFC chip, and is what is embedded in pretty much every phone or device that does NFC. It can pretty much do it all, such as read and write to tags and cards, communicate with phones (say for payment processing), and ‘act’ like a NFC tag. If you want to do any sort of embedded NFC work, this is the chip you’ll want to use! Comes with: the PN532 breakout board including a tuned 13.56MHz stripline antenna, 0.1″ header, 2 jumpers/shunts and a 4050 level shifter chip. We also toss in a MiFare Classic 1K card to start you off! We don’t have a detailed tutorial up yet but we do have a quickstart guide that will demonstrate the SPI interface on an Arduino and how to read the 4-byte ID burned into the card.